Made by a Fabricista: Channeling My Inner Audrey Hepburn With a Touch of Hot Pink! Happy New Year to everyone! I am sure you are getting ready for a celebration! For my dress for NYE, I decided to make a classic Little Black Dress with a touch of pink! I wanted a classic sillouette, so I chose to go with a round neckline and a midi length hemline. I opted for a fitted sleeveless dress. I chose to make the pattern from scratch this time instead of manipulating a commercial pattern. For the fabric, I used a gorgeous cotton sateen from Fabric Mart, and a hot pink shirting material for the flounce. This was a relatively easy project after my seven day coat I made with another gorgeous fabric from FM. 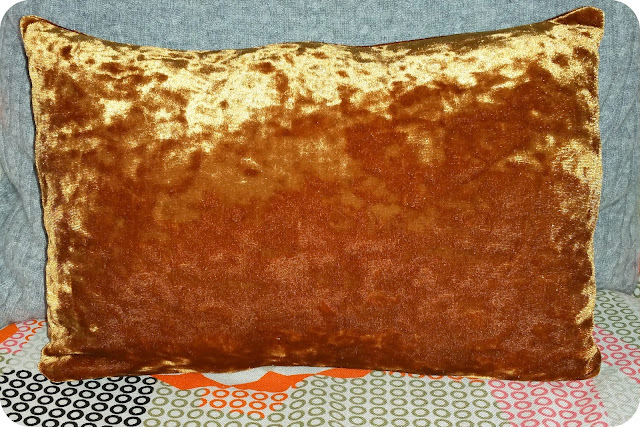 Here is a closeup of the flounce.. Isnt she gorgeous? And can we just have a moment to admire those shoes? 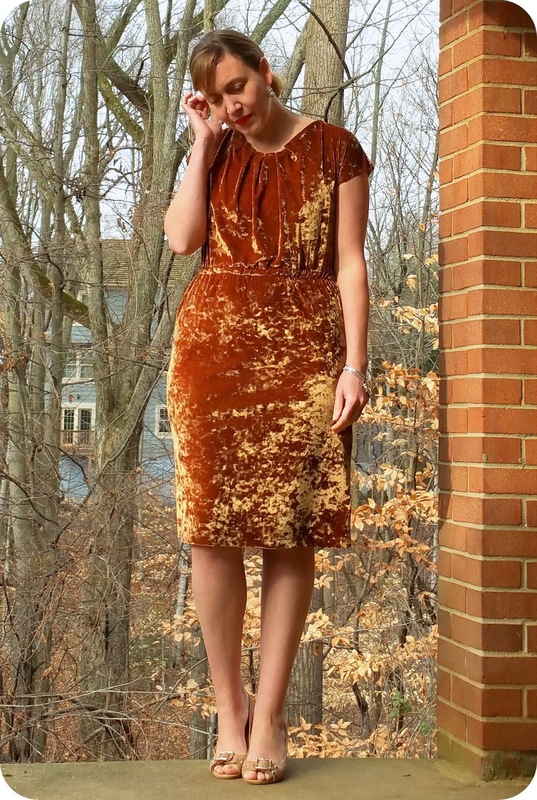 Made by a Fabricista: Quickie Stretch Velvet Cocktail Dress! Hi, all! Happy New Year (well, almost)! I know that for many of us getting together at the holidays is so important, and fun parties are always part of the offerings of festivities. That said, at the same time, we are always stuffed to the gills with things to get done before the festivities start, buying presents, getting cards mailed, shopping for pounds and pounds of groceries, and continuing with daily life, too. Last year I had found a pretty little pattern in a Burda magazine I had purchased from ebay. 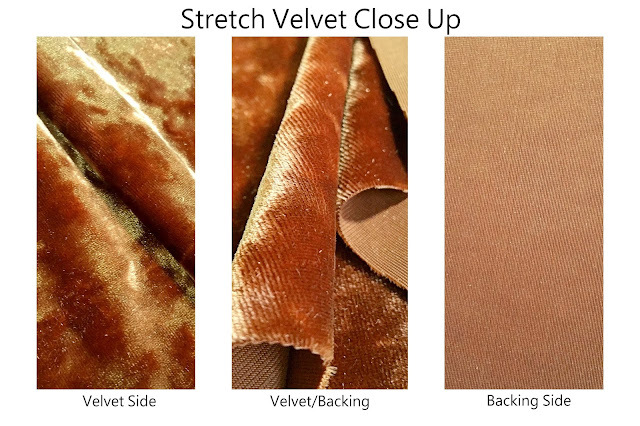 It was done in a velvet and looked exactly right for so many occasions. 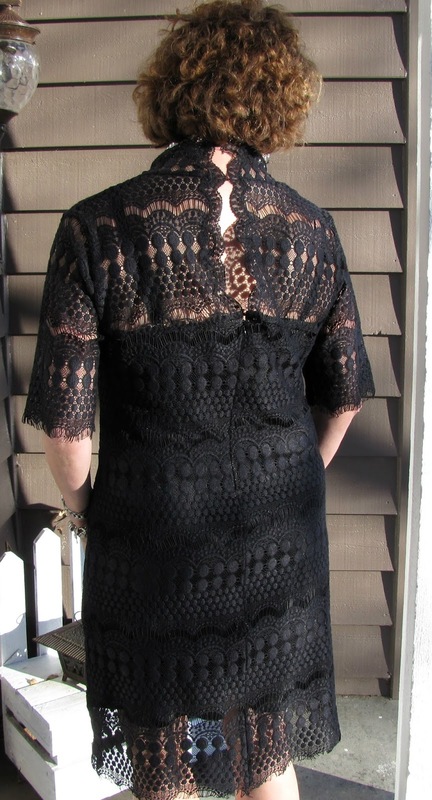 It is very boringly named the "Knit Dress" and can be found in the August 2009 issue. (For you all who use Dr. Google, you can search 08 2009 113 Burda to see more on it.) There are a ton of gorgeous versions of it over at the Burda Russian site, as well. This year I found the amazing Maple Sugar Crushed Velvet at Fabric Mart and scooped it up right away. I bought around 2 yards and it was more than enough for this project (even accounting for keeping all the pattern pieces in the same direction so the nap of the fabric will be down). I loved the color the most, it is a perfect shade of dark gold with a hint of rust and light brown. It literally sparkles in the sunlight, and inside, it takes on a more subtle dramatic sheen. I figure what could be more festive than a color like this? And since it isn't green or red, it really does work well for other occasions that are throughout the rest of the year. 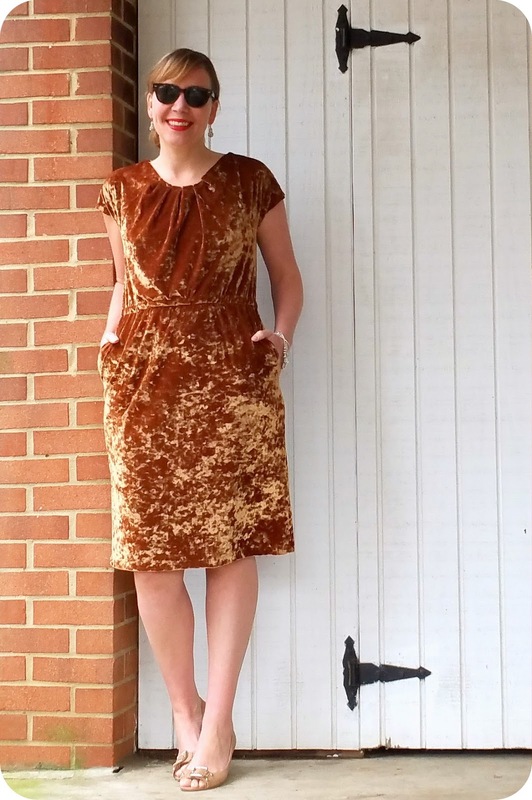 I have worked with velvet before, for this blog, here at my March make. The difference with that one is that it was a woven velvet and so I had to handle it differently. 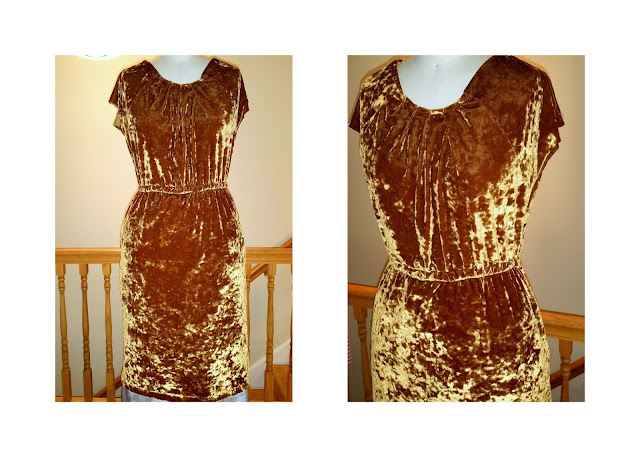 I still think I could have made this dress from a woven velvet, but I would have for sure had to size up. The project pattern pieces had to be traced by me and that took a little while, but no more than an hour. 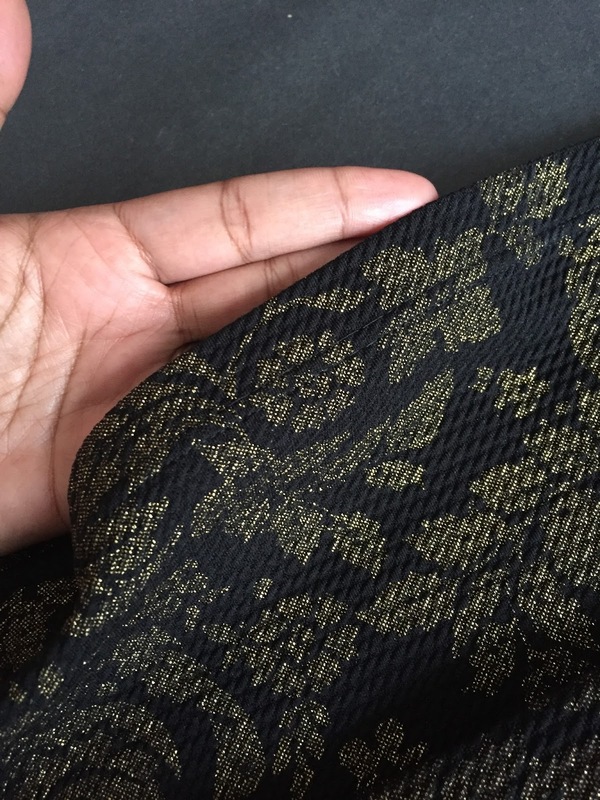 Once the pattern pieces were traced, I carefully laid out my pieces on the folded velvet. It is possible to fold the velvet and cut the pieces, but you MUST pin the fabric to the cutting board (I have a cardboard one that looks like this) to ensure the fabric doesn't slip and move. The cutting portion took about an hour, but the process was worth it since the pieces stayed fully on grain, with the nap running down (by this I mean that if my hand smooths the fabric from top to bottom, the nap will go down to the fabric base, not lift up away from the fabric base). Once the pieces were cut and I had marked all the places that needed marking (there weren't many on this pattern, but for any that needed it, I thread-marked them), I sewed up the garment. 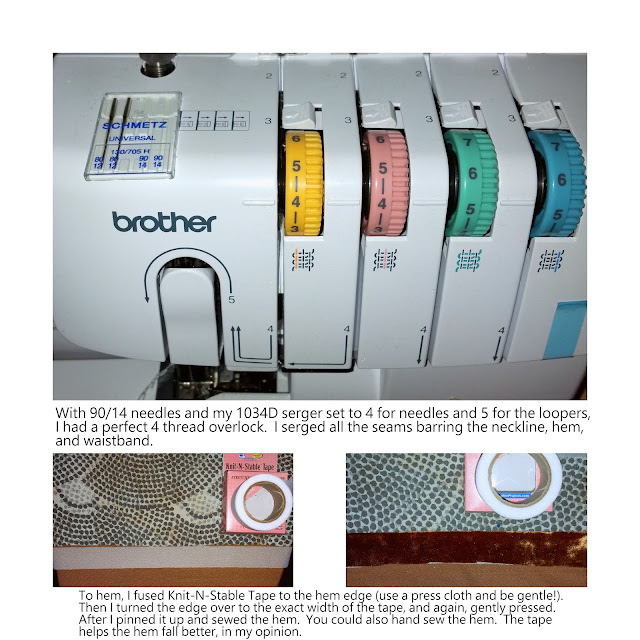 About half of the garment was sewn on the serger, and about half on the sewing machine. Any time I used the sewing machine I used my walking foot to keep the pieces in line and then made sure to pin the heck out of the bit I was sewing. Some places say to spray baste the seams, and while I like that idea, I didn't have any spray baste, so I just pinned like my life depended on it. :-) One thing I did do that really made my life easier was to interface the hem, just like I do on most of my knit garments. I use Knit-N-Stable tape which has a bit of stretch to it, and can be fused to fabric. The width is one inch, so it is perfect for hems (most of my hems end up one inch because of my height). I find that the interfaced hem holds stitches better, and when done, the garment always falls better with the interfacing in it. I found the pieces went together well in the process, but I just detested the way the neckline looked and since I had chosen not to make a lining bit so the front self-facing could attach to it (there was only one lining piece, btw, the rest is unlined), I had a dangling front self-facing that even if I had hand-stitched to the velvet wouldn't have laid right. I could take out the neckline I ended up creating (a tucked/pleated neckline) and add some kind of weight to the front self-facing (a chain or some small washers) and then hand-stitched it, the neckline might lay better, but to be honest, I don't love the way it looks on 90% of the garments (including the one Burda made), so I probably won't. For any future dresses I will be altering this pattern piece to make it have a proper facing and will switch up what the neckline does (it could be gathering, but I will move the gathering to the neckline itself instead of at the facing edge). I sewed up the size 36 which was graded out to a 40 at the hips and hem. I thought I was sewing the 38 and grading to a 42, but this dress is made from 34-42 and not 36-44 (as most of the patterns are), so I made a mistake that turned out fine. I think the 38 bodice would have been large on me. As it was, I had to take out 3/4" horizontally from the bodice front and back so it wouldn't blouse to much on my short torso. I added pockets! Given the choice, I will always add pockets. The pockets I used were the same ones I used on this skirt I sewed up for Fabric Mart in August. I would say the process of creating this dress took around six to eight hours. Definitely doable in a day, but it took me around two days because I take breaks and have three ridiculously active children. :-) So very much a "quickie" cocktail dress! I even had some extra fabric left over. Most of it will go to making a skirt for my daughter but the rest I crafted into a small pillow. I needed to test the serger settings so I sewed this up with the serger before I started in on my dress. I hope you all have a wonderful start to your new year. Happy sewing! I really wanted to sew something cute to wear on Christmas Day; not that we do anything fancy, at all! But it's fun to sew 'fun things', isn't it?? I was browsing the site (as I do almost daily - shhhh!) 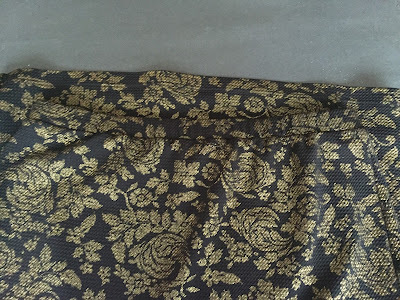 and saw this amazing gold foil floral double knit. 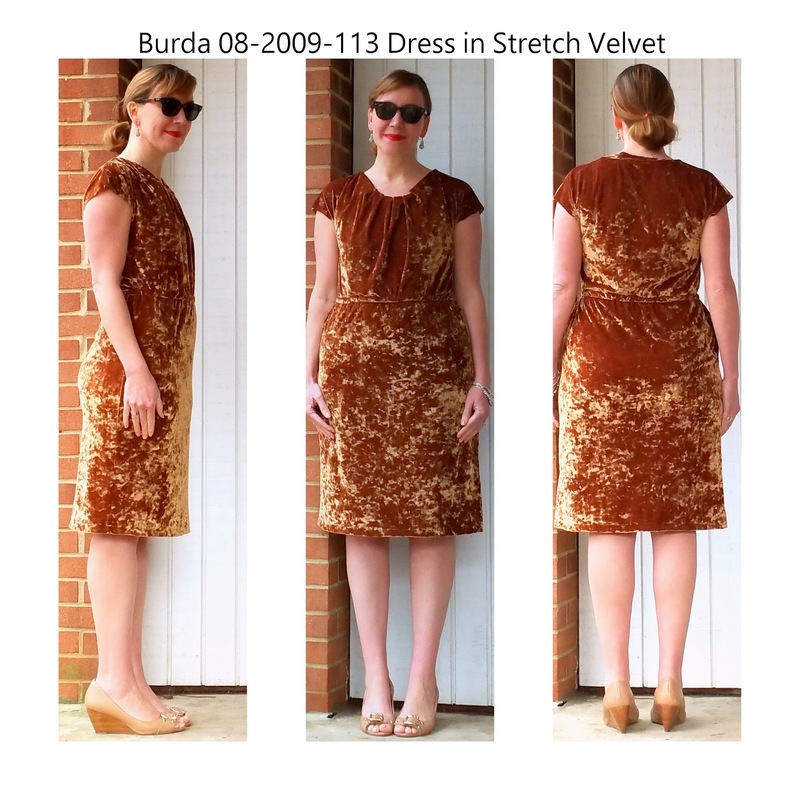 I initially thought it had to be a straight skirt because it would pair nicely with my Burda magazine top from the October 2015 issue. 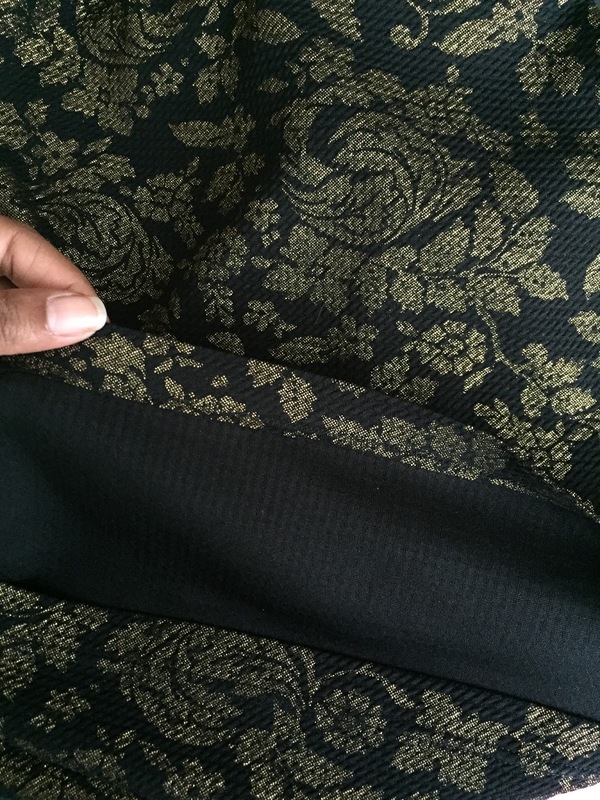 This was made in black ponte, which I almost always buy 5 yards of when Fabric Mart has it on sale! I only had a size 14 and really needed a 16. However, I knew I wanted this version to be fitted (but not body-con tight). I sewed 3/8" side seams for a little more room and pegged the skirt a bit. 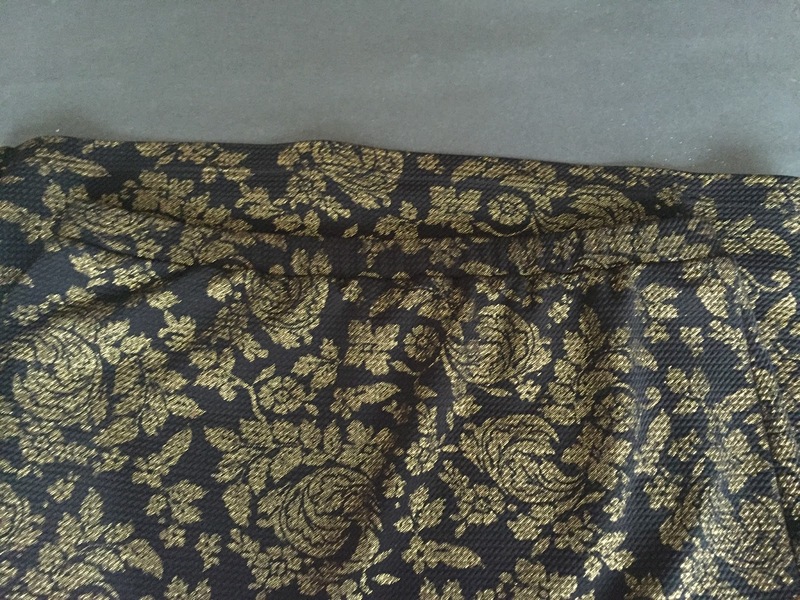 Also, I wanted it below knee length and cut in between views C and D. View C has a 23" finished length and view D has a 28" finished length; my skirt is 25". I used a fusible tricot to stabilize the hem and finished with a double needle. If you managed to snag a cut of this fabric, be sure to use a press cloth and press from the wrong side of the fabric as much as possible. I used 1" black elastic and cut it about 1" shorter than suggested. Again, I wanted it to sit snugly. So while it gathers at the waist when it isn't being worn, it's fine when it's on. The back side is solid black and as you see, I didn't bother serging the raw edge of the hem or anything, just turned up and pressed. I absolutely ADORE this skirt and it was such a perfect use for this fabric! Years ago, in my pre-sewing days, when I was single, childless, and therefore had much more disposable income, I once splurged on a set of designer pajamas made by Bedhead Pajamas. I loved those pajamas; they were made from a super-soft cotton in a fun print, and the piped edges and cuff seemed totally luxe. 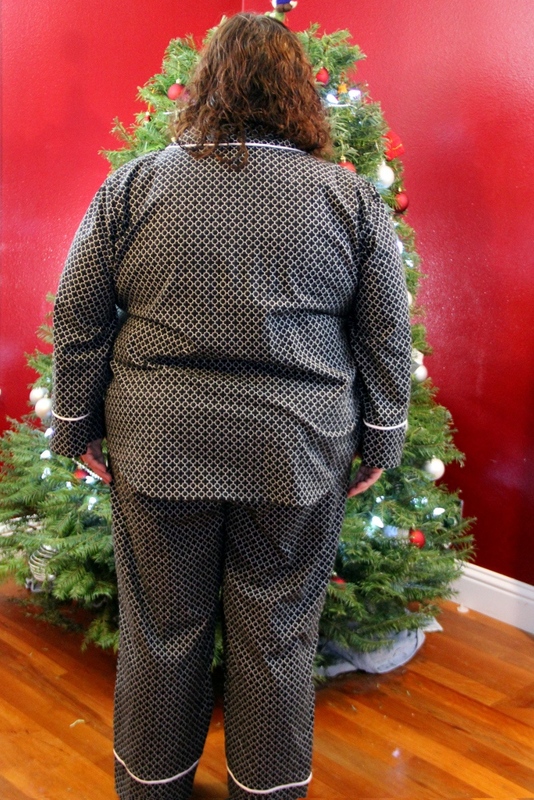 I've bought many sets of RTW pajamas over the years, but none came close to how those Bedhead Pajamas made me feel when I wore them. Fast-forward to 2015. I'm married, have a 3-year-old, a dog, an additional cat, and a mortgage. 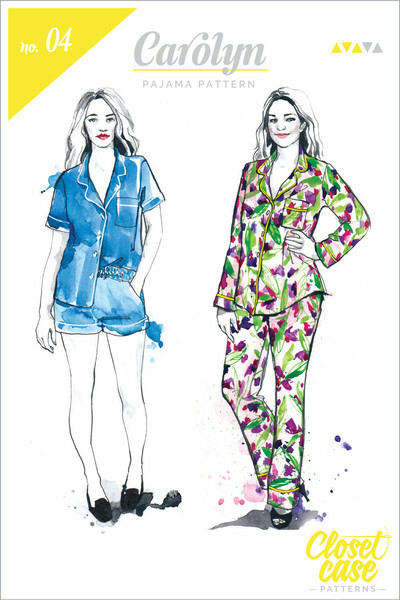 High-end pajamas haven't really been on my radar much in recent years, although once I started sewing, I always kept an eye out for a pajama pattern that could be used to knock off those beloved Bedhead PJs. Unfortunately, I found that most adult pajama patterns are fairly baggy-fitting and few had the piping details that I was looking for. Heather from CCF released the Carolyn PJ pattern earlier this year as the follow-up to her wildly popular Ginger Jeans pattern. The Carolyns have the option of short or long sleeves, shorts or pants, a body-skimming fit with a slightly flared leg, AND the piping detail that I love! They even have one important feature that my Bedhead PJs lacked--pockets in the pajama pants and shorts. When my husband recently teased me by calling my ratty old leggings and t-shirt that I usually wear to bed a "uniform", I knew that I had to do something about my pajama situation. 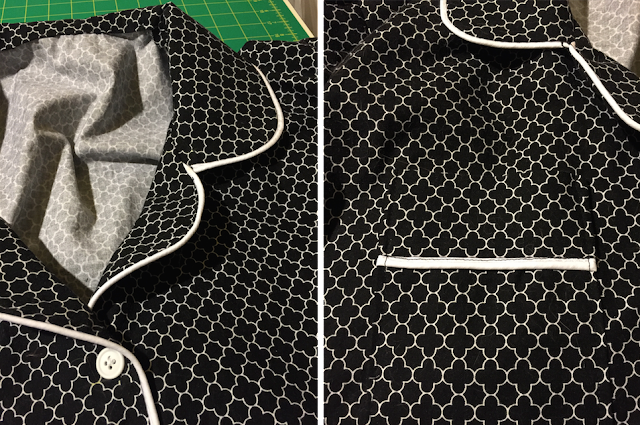 Having purchased the Carolyn pattern a few months ago and knowing that I had an upcoming project for Fabric Mart, this seemed like the perfect opportunity to finally knock off those Bedhead PJs of years past. As far as the fit goes, it's as-promised by the pattern. You won't need to size down two sizes to avoid swimming in your PJs like you might with some patterns; I found the size chart to be pretty accurate. 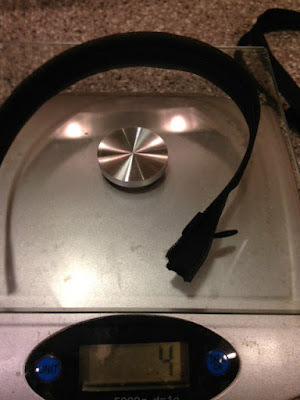 Truth be told, my measurements are a little outside of the size range for this pattern line. To get a nice fit, I did a full tummy adjustment and a full bum adjustment on the pants, and then a full bust adjustment (FBA) with the dart rotated to the side seam on the top. Looking at these pictures, I should have probably also done a sway back adjustment (that adjustment that I usually need but often forget to do) on the back of the top, as well. As I am only 5'2" tall, I also shortened the legs by 3" and the sleeves by 1.5". 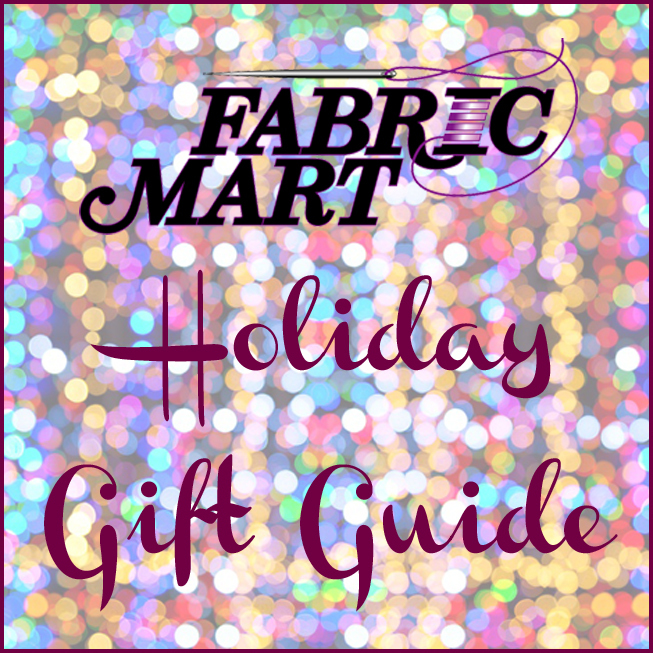 Because the piped view is finished with bands, rather than a traditional hem, if you're taller or shorter than the 5'6" that the pattern is drafted for, you'll want to adjust the length of the sleeves and pant legs directly on the paper pattern pieces BEFORE you cut out your fabric. The fabric, piping, and pattern were all a perfect combination to create a new version of the original designer pajamas that I set out to emulate. I am completely loving the weather we are having lately! This time last year, it snowed twice already. How did we did we get so fortunate to have 60 degree plus weather? Any who, my project for this week is a strapless jumpsuit I have been wanting to make for some time now. The fabric is Chili Red pepper Gabardine suiting from Fabric Mart. 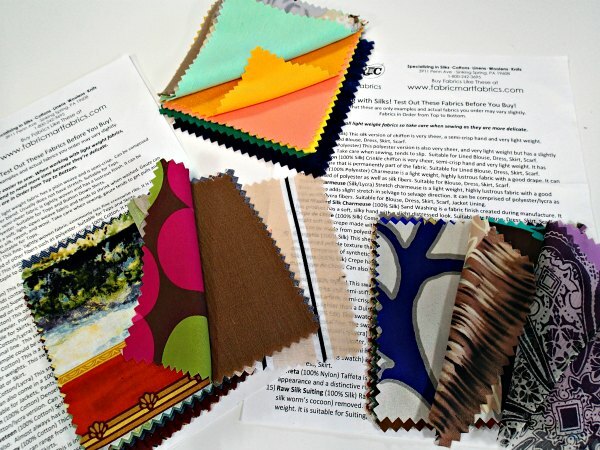 While this fabric is no longer available, a great substitution would be (here) and (here). Denim would be a great choice as well, as the Gabardine has the consistency of 4-5 ounce denim with absolutely no stretch. The color is very vibrant and one of my go to's for pops of color in the fall. I am thinking about wearing this to bring in the new year. The top of this jumpsuit was constructed using the top of Vogue 8766. I thought and thought for quite some time about making this top as I am NOT a fan of tube/strapless tops. I absolutely LOVE the look but the execution for me has always been troublesome. 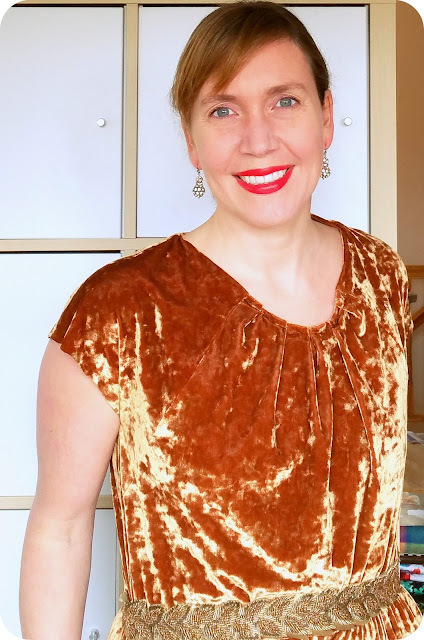 Whether it is retail or created, a top, dress, or a jumpsuit, I often have to get creative with the top for comfort and keep the "pull ups" to a minimal. I actually have this same issue with each and every strapless bra I have ever purchased (TMI). On the flip side, I have constructed garments for others with this and other patterns with no issues at all. I am beginning to think its just a defect in my body type lol. For the construction, I used the Dritz Featherlite Boning. The pattern calls for boning on the sides only, but I added it to the front as well. I think we've already established I need support! For the bottom, I used McCall's 6756 drafted into pants. I made a sloper of this pattern so I can change the pockets and zipper placement etc.... I am a sucker for wide leg pants and think I took more than enough time off from making them :). All in all, I love this look. It was gloomy outside, but the weather was beautiful! I also created the clutch for this outfit which is part of a group of clutches I am making and am excited about! Happy Sewing and upcoming New Years to you all! 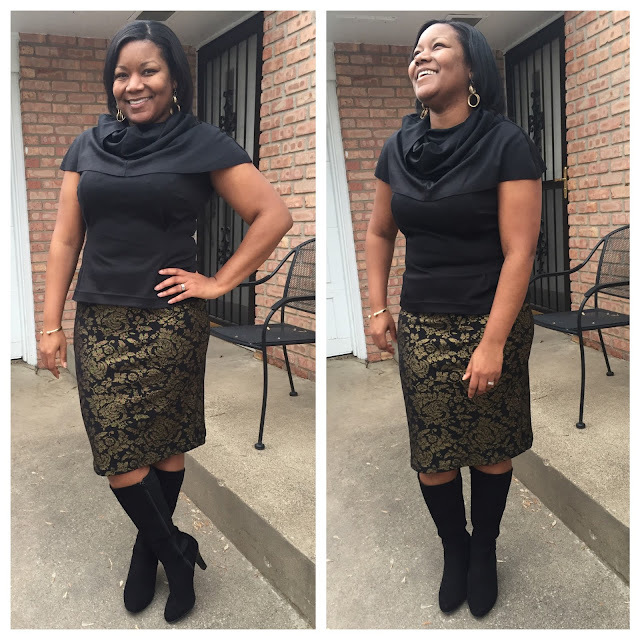 I love the holidays, and even more, I love wearing something I've made. 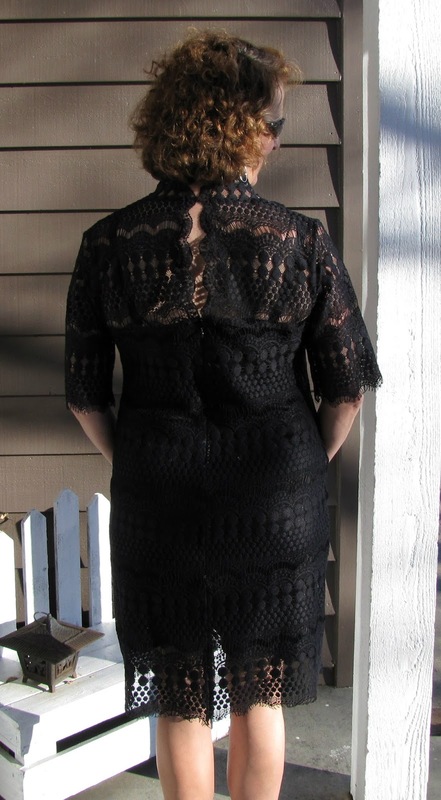 Well, this year, I decided to make a beautiful lace dress. I've never tackled a project like this, so grab a coffee or your favorite beverage, and I will walk you though my journey. 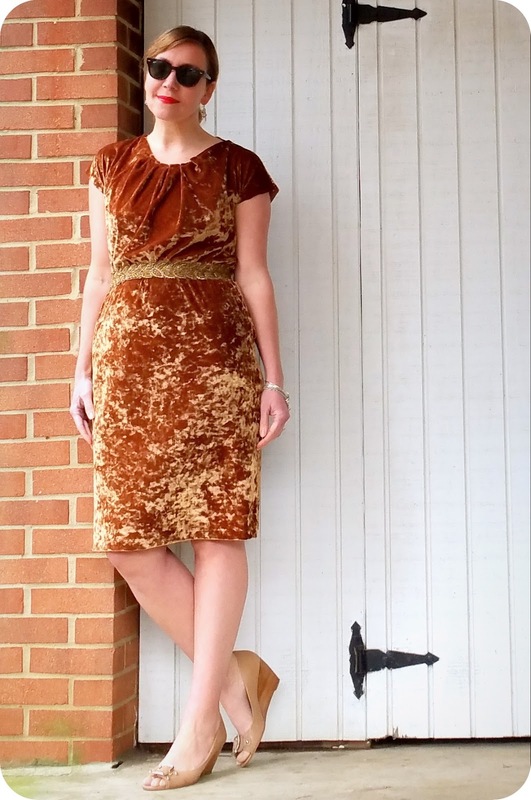 I choose this lovely pattern from StyleArc, the Alisha Dress. I've had my eye on this dress for a very long time but wondered where on earth I would wear it and could I create it in a way that I would be proud of? Typically I am not a fearful sewer, so I just got busy and created my dress. A wonderful party dress complete with a slip. 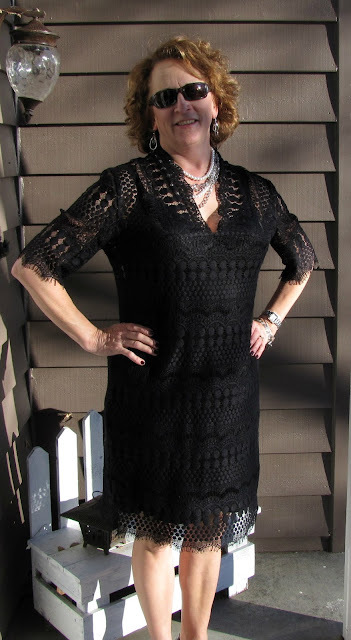 Use scalloped lace to create beautiful and interesting neckline. The lace edge can also be used on the hem and sleeves. 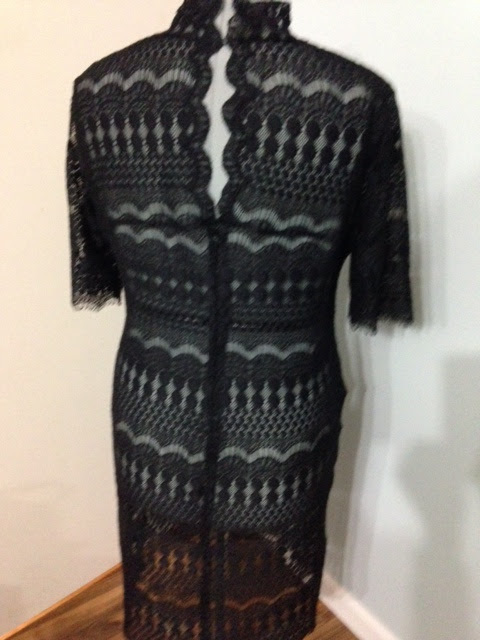 This pattern can be made many ways - all lace, lace yokes & sleeves with plain body, or completely plain. The choice is yours! Those design lines are so pretty! I love the separate slip cut on the bias since bias cut garments just glide over your skin and feel wonderful! I also really like the elbow length sleeves with the zipper back and opening at the shoulder blades to the neckline where it closes with a hook and eye. Since I've not made a dress such as this, I choose to make not one but two muslins and I am very happy I did so! While I typically don't hardly alter a StyleArc pattern, since this was made in lace and more delicate to handle, I knew I would get a better feel of how the garment went together through the practice-fit. 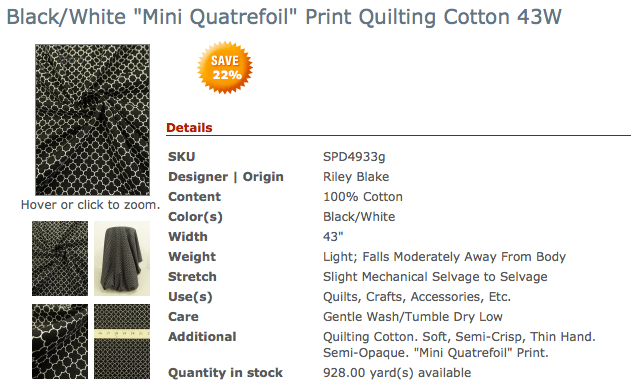 I just used a lightweight gabardine to test this for my first and second muslin. The first time through, I made the pattern as is with my usual 1/2" swayback adjustment and also a sort of new alteration for me and that is a slight (3/8") sloping shoulder adjustment. And, constructed the dress as the pattern was written. Honestly, if you think about the look of the dress and read carefully, this dress will make sense. After the initial fitting, I decided I wanted to have more room in the torso so I took out the optional darts and felt so much better about how the dress felt and how it looked on me! I knew I could always add the darts at a later time if needed. 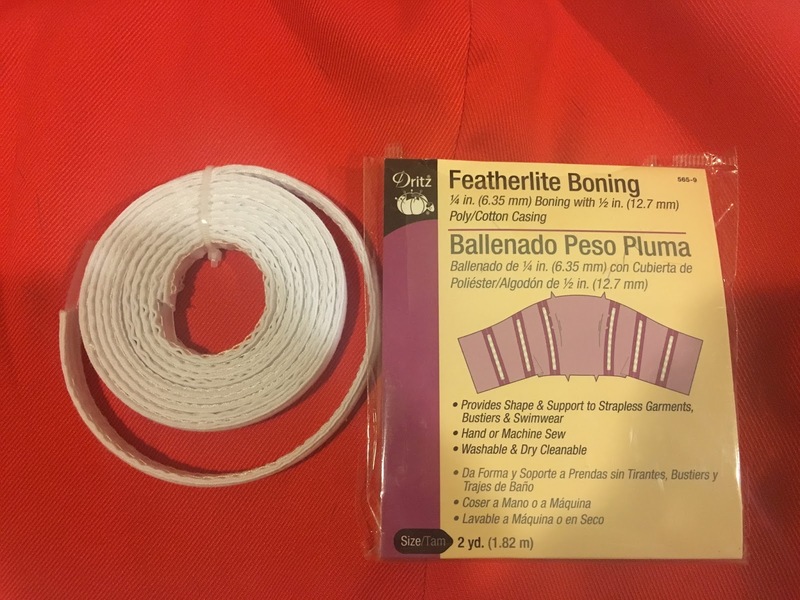 I also raised the back seam that runs along the shoulder blades by an inch at the center back, as I didn't want my bra to show and yes, I will wear a bra. I am 52 years old and wear a C-cup, I am assuming if you were me, you would too. :) I also had to take in the armscye from the shoulder seam to the underarm on the back of the dress. Maybe I have a narrow back as well? The second muslin fit so much better and I held my breath as I cut into the lace. Let's talk about the lace for a minute. It was so lovely to work with and I like the design that has geometric patterns in it. 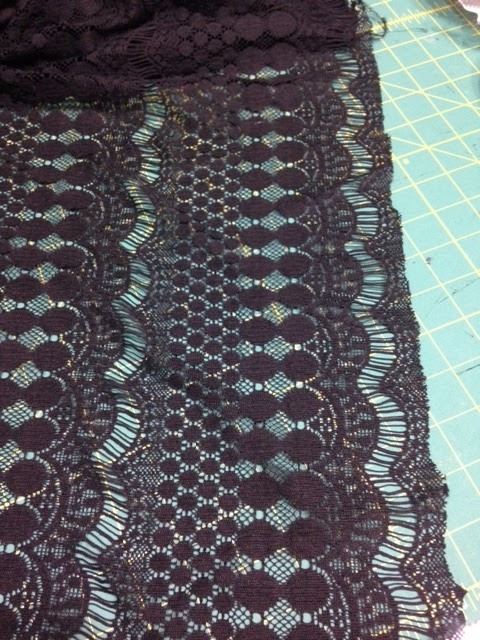 I was very leery as to how to finish off the seams so they wouldn't pull apart as some of the lace has some open places. 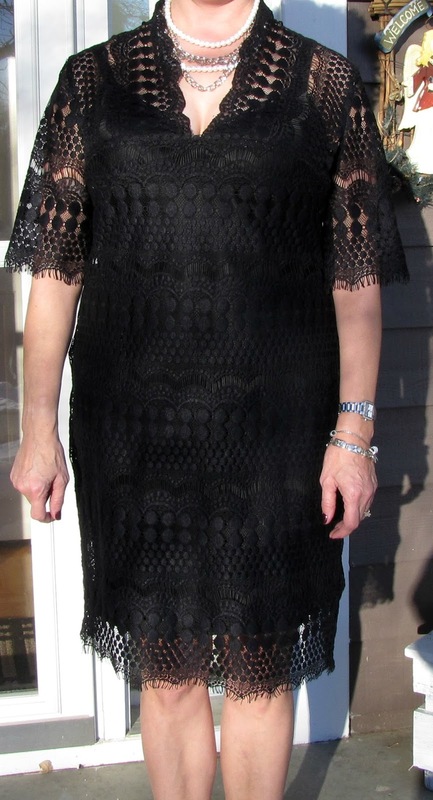 And, since this dress is so lovely, I am considering wearing it to my son's wedding in January. I plan on dancing and can you imagine if the seams popped while I was doing the hustle on the dance floor? I researched quite a bit and came up with using silk organza cut into 1/2" strips and stitching those strips along the seams. See how nicely the seams finished off after serging? The organza is black, just like the lace and is barely visible. I used the organza to reinforce the zipper insertion as well but instead of the silk on one side of the seam, I put it on both. 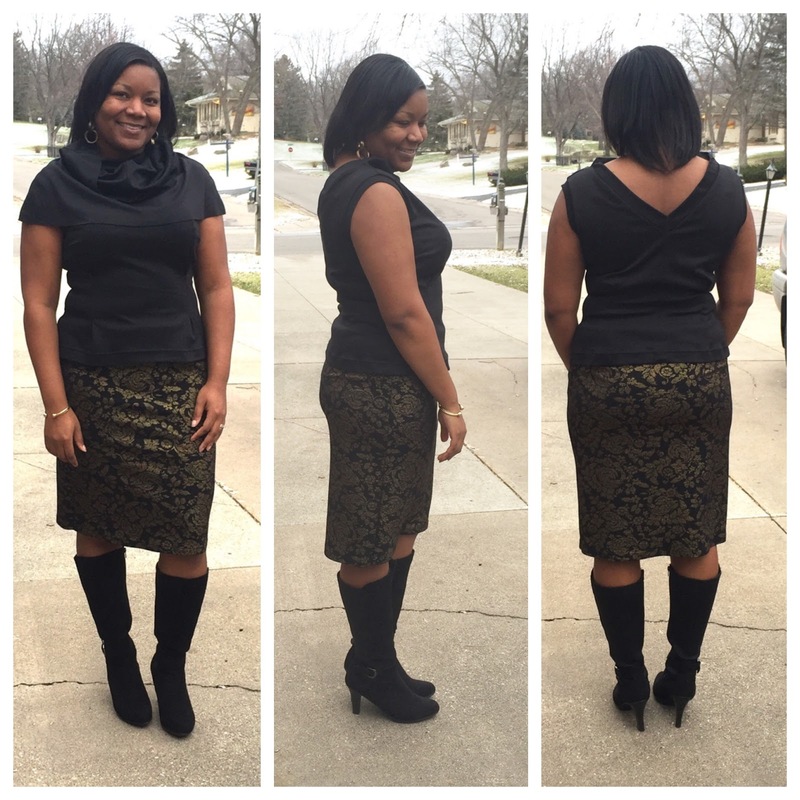 I also used the lace pattern itself to create the hems on the skirt and sleeves. 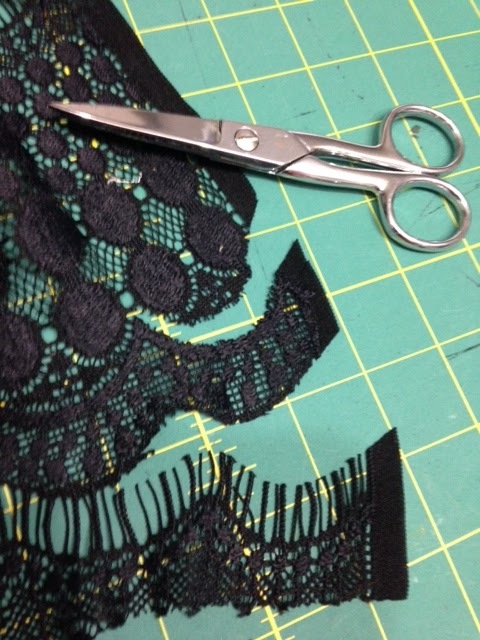 I practiced a bit by cutting different parts of the lace to see what I liked and I settled on this fringe base which I created by cutting off a portion of the lace pattern. Another concern I had was due to the construction process. The directions tell you that when you are attaching the front and back bodice, you stitch to a dot, raise your presser foot, clip to the notch, pivot the fabric and carry on. I didn't want to risk cutting too far, so I staystitched the neckline and sewed a small piece of the organza to the pivot point to reinforce it and make me feel better about constructing this dress in lace. I must admit, it worked beautifully. Everything was going really well but I wasn't sure how to finish off the front and back neckline and I was a little worried about inserting a zipper in the lace. Again, I looked to the lace for the answer and I cut a portion of the design off and used a very narrow zigzag to attach it to the bodice. I simply stitched slowly and followed the edge of the design. After applying the edging, I used my applique scissors to trim the excess away. The left side is before I applied the edge. The right side shows my work in process. I normally wouldn't post a picture of my chest like this, but it does show the neckline really well. As you can imaging, dear husband took this photo when I wasn't looking. Regular zipper--six grams. Those two grams make a difference! Trust me! While it sounds like this dress was a ton of work, it really wasn't. The lace was lovely to work with and it behaved just beautifully. It presses well and I am so happy with the end result. I almost forgot that I also made the slip as well! 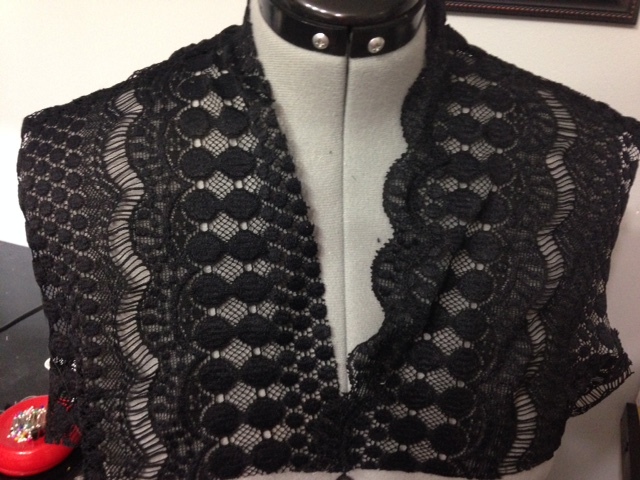 This is included in the pattern and I ordered this black charmeuse that was heavenly to work with. Luckily the pattern has a c-cup bodice for the slip and I made it as is. You don't need any special tools but I do have a recommendation for a bias-cut garment. Let the slip hang for at least 24 hours before hemming. 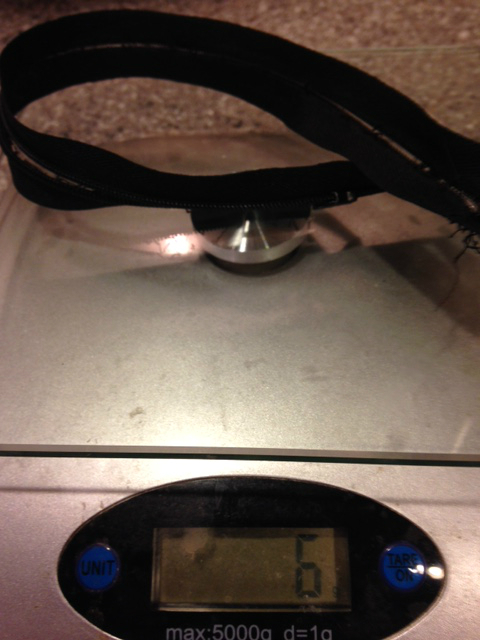 If you have wonder clips, attach those every three or four inches to help the garment hand properly. If you don't have wonder clips, you could also use safety pins every few inches just a few threads up from the hemline. 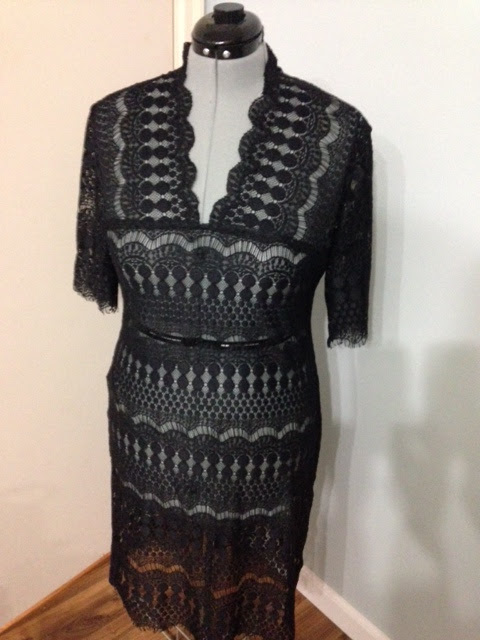 I can't wait to wear my new lace dress! I know, it is pretty fancy, but I think it will be perfect for my son's wedding!